Մետաղներն ու ոչ մետաղներն այնուհետև կարող են դասակարգվել ենթակատեգորիաներում, աղյուսակի շարքերում՝ ձախից աջ ընթանալիս տեղի է ունենում մետաղական հատկությունների անցում ոչ մետաղականին: Մետաղները կարող են ենթադասվել ալկալիական (ուժեղ ռեակցիոնունակությամբ), հողալկալիական մետաղների (ավելի փոքր ռեակցիոնունակությամբ), լանթանիդների և ակտինիդների, անցումային մետաղների, վերջացրած՝ քիմիապես թույլ հետանցումային մետաղներով: Ոչ մետաղները կարող են ուղղակի բաժանվել. Կան որոշ բացառություններ ընդհանուր կանոնից. 32 սյունակներով պարբերական աղյուսակի չորս բլոկներում ձախից աջ կան մի շարք կապակցված խմբեր, որոնք տեղակայված են բլոկների միջև: Այդ խմբերը, ինչպես մետաղանմանները, ցուցաբերում են երկու կողմերում գտնվող խմբերի խառը հատկություններ. ↑ The elements discovered initially by synthesis and later in nature are technetium (Z=43), promethium (61), astatine (85), neptunium (93), plutonium (94), americium (95), curium (96), berkelium (97) and californium (98). ↑ An element zero (i.e. a substance composed purely of neutrons), is included in a few alternate presentations, for example, in the Chemical Galaxy. ↑ There is an inconsistency and some irregularities in this convention. Thus, helium is shown in the p-block but is actually an s-block element, and (for example) the d-subshell in the d-block is actually filled by the time group 11 is reached, rather than group 12. ↑ The noble gases, astatine, francium, and all elements heavier than americium were left out as there is no data for them. ↑ While fluorine is the most electronegative of the elements under the Pauling scale, neon is the most electronegative element under other scales, such as the Allen scale. ↑ In the context of Mendeleev's observation, Glinka adds that: 'In classing an element as a metal or a nonmetal we only indicate which of its properties—metallic or nonmetallic—are more pronounced in it'. ↑ While Lr is thought to have a p rather than d electron in its ground-state electron configuration, and would therefore be expected to be a volatile metal capable of forming a +1 cation in solution like thallium, no evidence of either of these properties has been able to be obtained despite experimental attempts to do so. It was originally expected to have a d electron in its electron configuration and this may still be the case for metallic lawrencium, whereas gas phase atomic lawrencium is very likely thought to have a p electron. 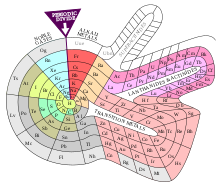 ↑ An antecedent of Deming's 18-column table may be seen in Adams' 16-column Periodic Table of 1911. Adams omits the rare earths and the "radioactive elements" (i.e. the actinides) from the main body of his table and instead shows them as being "careted in only to save space" (rare earths between Ba and eka-Yt; radioactive elements between eka-Te and eka-I). See: Elliot Q. A. (1911). "A modification of the periodic table". Journal of the American Chemical Society. 33(5): 684–688 (687). ↑ A second extra-long periodic table row, to accommodate known and undiscovered elements with an atomic weight greater than bismuth (thorium, protactinium and uranium, for example), had been postulated as far back as 1892. Most investigators considered that these elements were analogues of the third series transition elements, hafnium, tantalum and tungsten. The existence of a second inner transition series, in the form of the actinides, was not accepted until similarities with the electron structures of the lanthanides had been established. See: van Spronsen, J. W. (1969). The periodic system of chemical elements. Amsterdam: Elsevier. p. 315–316, 0-444-40776-6. ↑ See The Internet database of periodic tables for depictions of these kinds of variants. ↑ But for the existence of the lanthanides the composition of group 3 would not have been a source of any special interest, since scandium, yttrium, lanthanum and actinium exhibit the same gradual change in properties as do calcium, strontium, barium and radium in group 2. ↑ The detachment of the lanthanides from the main body of the periodic table has been attributed to the Czech chemist Bohuslav Brauner who, in 1902, allocated all of them ("Ce etc.") to one position in group 4, below zirconium. This arrangement was referred to as the "asteroid hypothesis", in analogy to asteroids occupying a single orbit in the solar system. Before this time the lanthanides were generally (and unsuccessfully) placed throughout groups I to VIII of the older 8-column form of periodic table. Although predecessors of Brauner's 1902 arrangement are recorded from as early as 1895, he is known to have referred to the "chemistry of asteroids" in an 1881 letter to Mendeleev. Other authors assigned all of the lanthanides to either group 3, groups 3 and 4, or groups 2, 3 and 4. In 1922 Niels Bohr continued the detachment process by locating the lanthanides between the s- and d-blocks. In 1949 Glenn T. Seaborg (re)introduced the form of periodic table that is popular today, in which the lanthanides and actinides appear as footnotes. Seaborg first published his table in a classified report dated 1944. It was published again by him in 1945 in Chemical and Engineering News, and in the years up to 1949 several authors commented on, and generally agreed with, Seaborg's proposal. In that year he noted that the best method for presenting the actinides seemed to be by positioning them below, and as analogues of, the lanthanides. See: Thyssen P. and Binnemans K. (2011). 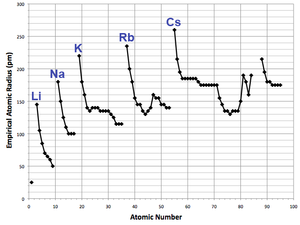 "Accommodation of the Rare Earths in the Periodic Table: A Historical Analysis". In K. A. Gschneider Jr. (ed). Handbook on the Physics and Chemistry of the Rare Earths. 41. Amsterdam: Elsevier, pp. 1–94; Seaborg G. T. (1994). Origin of the Actinide Concept'. In K. A. Gschneider Jr. (ed). Handbook on the Physics and Chemistry of the Rare Earths. 18. Amsterdam: Elsevier, pp. 1–27. ↑ The phenomenon of different separation groups is caused by increasing basicity with increasing radius, and does not constitute a fundamental reason to show Lu, rather than La, below Y. Thus, among the Group 2 alkaline earth metals, Mg (less basic) belongs in the "soluble group" and Ca, Sr and Ba (more basic) occur in the "ammonium carbonate group". 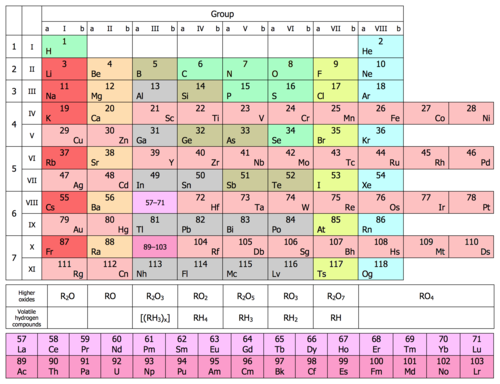 Nevertheless, Mg, Ca, Sr and Ba are routinely collocated in Group 2 of the periodic table. See: Moeller et al. (1989). Chemistry with Inorganic Qualitative Analysis (3rd ed.). SanDiego: Harcourt Brace Jovanovich, pp. 955–956, 958. ↑ Even if metallic lawrencium has a p electron, simple modelling studies suggest it will behave like a lanthanide, as do the rest of the late actinides. ↑ Notwithstanding, an IUPAC member subsequently wrote that, "IUPAC has not approved any specific form of the periodic table, and an IUPAC-approved form does not exist, though even members of IUPAC themselves have published diagrams titled “IUPAC Periodic Table of the Elements". However, the only specific recommendation IUPAC has made concerning the periodic table covers the Group numbering of 1–18." ↑ Karol (2002, p. 63) contends that gravitational effects would become significant when atomic numbers become astronomically large, thereby overcoming other super-massive nuclei instability phenomena, and that neutron stars (with atomic numbers on the order of 1021) can arguably be regarded as representing the heaviest known elements in the universe. See: Karol P. J. (2002). "The Mendeleev–Seaborg periodic table: Through Z = 1138 and beyond". Journal of Chemical Education 79 (1): 60–63. ↑ Scerri, one of the foremost authorities on the history of the periodic table, favoured the concept of an optimal form of periodic table but has recently changed his mind and now supports the value of a plurality of periodic tables. ↑ Venable, pp. 96–97; 100–102. ↑ Greiner W., Schramm S. (2008)։ «Resource Letter QEDV-1: The QED vacuum»։ American Journal of Physics 76 (6): 509։ Bibcode:2008AmJPh..76..509G։ doi:10.1119/1.2820395 , and references therein.